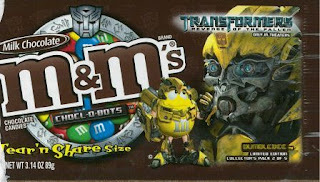 Package number two in my line up of M&M’s wrappers features the humble bumblebee. Once a yellow Volkswagen in the original, Bay has given him a makeover as a stunning 2009 Chevy camero. If I had a camero like that, it would be yellow with the black racing stripes and I am sure I would put the autobot logo somewhere on the car. Sorry, that is the kid in me talking! Shown here in his bumblebee gear is Yellow together with Bumblebee striking a pose. And yes this is a “tear and share” package and I did share. My daughter Lily loves M&M’s and had to have a few.